In the fast-growing region, which urban centers are poised to become the model city of the future? All smart cities, including those on this list, are on the journey towards being smarter, but none of them have arrived. Asia Pacific is a region with unique challenges and opportunities in the smart cities arena. China’s cities are growing at an unprecedented pace stressing their infrastructure and creating significant congestion and air contamination challenges. This has lead the national government to support the creation of dozens of new purpose-built smart cities, 100 of which will have over 1 million people in a decade or so. Japan is home to many innovative technology and automotive companies looking to implement their solutions in Japan and abroad. Yet they have the opposite problem from China in that they have a declining population. What can Japanese cities do to attract creative, entrepreneurial citizens from around the world to infuse innovation and growth into their economies? Farther south, Australia and New Zealand offer a very high quality of life as measured by most criteria. Yet these cities in general provide poor access to quality, efficient, and green public transit and are often more sprawled than many North American cities. Australian and New Zealand cities will need to grow up more than out, and invest more in multi-modal transit options for their citizens as they continue on the smart cities journey. Just last week we published the 2013 top 10 rankings for North America. This week we continue our four-part regional series with a focus on the Asia Pacific region. The methodology applied for all regions is the same. 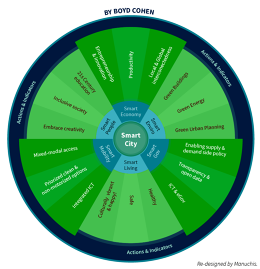 Using the Smart Cities Wheel, a framework I created to help quantify smart cities, I identify publicly available datasets for each of the six components and then supplement the analysis with primary data sourced directly from the cities themselves using 28 indicators. Unlike their North American and European counterparts, none of the eligible cities actually submitted their primary data. Read more about the full methodology here. Perhaps it is not surprising that the home of Samsung is a leading player in the smart cities arena in the Asia Pacific region. Seoul scores off the charts with respect to digital governance and open data. The city currently has more than 1,200 open data sets for use by the general public and the private sector. They also have been innovative in the use of digital tools for supporting citizen participation. Besides digital transactions and real-time information on transit, jobs, etc., the city offers the OASIS Online Policy Suggestion System to receive planning suggestions from the public online (more than 5 million contributions so far!). Of course, it’s impossible to discuss smart city developments in Seoul without discussing the controversial experiment that is Songdo. Songdo, like several counterparts in China, is a purpose-built “smart city” adjacent to the Seoul airport, with a future projected population of 2 million people. Songdo contains 40% green space, universal broadband, integrated sensor networks, green buildings, and an innovative underground system of tubes for transporting kitchen waste from buildings directly to a processing facility which will convert the waste into clean energy. While Songdo has its critics, especially due to the lack of citizen engagement and organically derived culture, it is a smart city experiment worth watching. Visiting Singapore, it is hard to come away less than impressed with the radical transformation this city-state has gone through in recent decades. It is a clean, organized, technological city with excellent public transit systems (especially their metro) and a commitment to sustainable development. In fact, Singapore has one of the lowest carbon footprints of any major city in the world (around 2.7 tons of CO2 per capita). Last year, Singapore introduced the Gardens, a park of 18 high-tech artificial trees which do everything from house PV panels to provide ambient cooling within the park. One of my favorite aspects of smarter cities, is how they leverage public policy tools to inspire innovation and support local sustainable economic development. Singapore has turned one of their biggest urban challenges, a dependence on imported potable water from Malaysia, into a strength. Due to policies supporting innovation to address their water shortage, Singapore now has more than 100 companies generating $370 million in annual revenue from selling their rainwater collection and water recycling technologies around the globe. In fact, since 2006, Singapore’s water-tech sector has generated more than $7 billion in international projects. I believe that a smart city must lead by example, establish baselines and co-create (with their citizens) a strategy for the future complete with measurable targets. Japan has established a bold strategy for 2020 which includes eight measureable goals for the future. These include: increased resilience to disasters (think earthquakes); significant creation of local renewable energy generation, creation of 1,000 hectares of new green space, and numerous programs for citizen engagement and social inclusion such as sending 10,000 youth on study abroad programs, creating 30,000 new jobs for the disabled and supporting the creation of 70,000 new spaces for childcare. Smart cities must also attack their environmental and carbon footprints. The Tokyo Metropolitan Government was the first city in the world to establish a city-based cap and trade program in 2010. Since then the program has already resulted in a 23% reduction in emissions. Hong Kong is considered one of the most innovative cities in the world. The Hong Kong Innovation and Technology Commission, established in 2000, supported the creation of five clusters including: automotive, ICT, logistics, nanotechnologies, and textiles. Since their creation, the commission has facilitated the generation of more than $3 billion in R&D projects across the five target clusters. Hong Kong also scored the highest in my ranking for smart mobility. Being one of the most dense cities in the world, Hong Kong residents have embraced non-motorized and public transit. According to my data analysis, Hong Kong residents average 218 metro trips per year. The Octopus Smart Card, first issued in 1997, allows Hong Kong residents to make electronic payments for all forms of public transit and parking as well as with private sector businesses such as grocery stores and vending machines. In 2006, the Octopus Smart Card received the World Information Technology and Services Alliance (WITSA) Chairman’s award for its innovative use of technology and ubiquitous use in the city (more than 7 million daily users). Auckland is the first of four cities in Australia and New Zealand to make the top 10 for this smart cities ranking. In the Asia Pacific region, Auckland has frequently claimed top spot in quality of life rankings. No surprise given it possesses 1,600 kilometers of coastline and a relatively mild climate. It is also home to two-thirds of the companies top 200 companies. Auckland posses relatively low income inequality with a Gini Index score of .31 which suggests social inclusion and low crime rates. Earlier this year, Auckland committed to being one of the first nine cities to partner with Microsoft in the launch of their CityNext platform which aims to transform municipal government and support innovation through the use of information and communication technologies and big data in areas such as transportation, energy and buildings. We’ll stay tuned as the project gets implemented in Auckland. Sydney was amongst the first cities to seek to leverage the resources and attention of hosting the Olympic games as a way to green their city. The Sydney Olympic village is a 90 hectare mixed-use development project entailed the implementation of renewable energy solutions such as the installation of 12 PV cells on every home, a building waste recycling system which resulted in the recycling of up to 90% of waste wood concrete and bricks, and of course new public transit connectivity. Sydney’s green Olympics inspired other smart cities such as London and Vancouver to go even further to embrace sustainable and smart cities. More recently, Sydney has been experimenting with several clean and smart technology projects. Sydney Water and the University of Sydney are amongst the partners in a project entitled “Smart Grid, Smart City” which is testing a range of smart city technologies from smart infrastructure such as smart grids to smart home solutions in Sydney and throughout Australia. Some of the smart home technologies they are testing include fuel cell and waste heat recover for hot water, electric vehicle use and charging, smart meters and in-home water reuse and recycling. Coming in just behind its Australian peer, Melbourne also has made progress towards becoming a more sustainable and smarter city. Melbourne was actually rated the greenest city in the Asia Pacific region by Solidiance in 2011. Melbourne is an active member of the Clinton Foundation’s C40 Cities initiative. They have set an ambitious goal of a 100% reduction in CO2 emissions over 2006 levels. In 2003, Melbourne completed one of the largest urban solar projects on the roof of Queen Victoria farmers market. In 2010, Melbourne launched the 1200 Buildings Program to incent the retrofitting of major buildings throughout the city. Aside from the carbon reductions, their aim is to drive $2 billion in private sector investment and the creation of 8,000 green jobs. According to my research Osaka residents are the most active users of Osaka’s extensive metro system, averaging 321 metro rides per capita per year. Adapting their own Livability Index to incorporate smart density (over sprawling cities), the Economist Intelligence Unit recently ranked Osaka third in the world in their “Spatially Adjusted Livability Index.” Aside from transit and livability, Osaka has been testing smart home technology since 2011. In collaboration with Osaka Gas, the Smart Home project implemented a combination of clean energy solutions and a home energy management system (HEMS), resulting in an 88% reduction in power consumption over comparable homes in Osaka. Next steps include integration of an EV and a conversion to 100% solar for home heating. The third and final Japanese city to make the top 10, Kobe has been working to green their building stock through the Comprehensive Assessment System for Built Environment Efficiency Program (CASBEE). Kobe currently counts 450 green certified buildings through the CASBEE program. Over the past decade Kobe has also sought to transform its municipal water and waste management practices. Kobe has shifted their strategy from waste-to-landfill towards recycling and reuse of waste and wastewater. Rounding out the top 10 this year is Perth, Australia. Beginning in 2009, Perth began a $73 million, three-year project entitled Perth Solar City. It entailed a range of smart and clean technology pilots including the installation of more than 9,000 smart meters, installing new solar capacity in 1,800 homes and delivery of energy efficiency consultations to more than 3,500 homes. In 2012 alone, the families participating in Perth Solar City achieved a total of $1 million in energy savings. Stay tuned for our next regional ranking installment to be published in early December: Latin America.